Linen is a natural fibre, made from the stalk of the flax plant. Here in Europe we regard it as the most natural, the most strongest and best quality fabric you can get your hands on, next to hemp. In Europe we consider linen as an heirloom and linen sheets will be passed on to the next generation. So to me, as a Dutch girl, it’s my favorite fabric to work with, besides that it is extremely durable and eco friendly. I have fallen head over heels in love! Linen is very soft and it will actually softener with aging, it has a beautiful look and feel to it. It’s much stronger than cotton and linen itself, organic or not organic, is eco friendlier than cotton ever was. For Pure Prana Label I’m always on the lookout for the best qualities and certified fabrics. Completely natural, flax linen makes great fabrics for meditation products. Did you know linen has been used for more than 6000 years? Traceable in ancient texts, mentioned for its healing properties? Flaxs grows abundantly without chemicals, can grow easily on poor soil, needs no water irrigation, is fully biodegradable and we use the complete plant! Flax knows all about Zero waste! In addition to this already great fabric, most of the fabrics I use have an Okoe Tex Standard 100 certification, others don’t.. BUT have been washed with enzymes, which means they are treated without chemicals. Choosing Pure Prana Label means that your cushion isn’t mass produced, it comes with good vibes, great detail and no child labor was involved in your product. Your meditation product is made in Europe and made only, only for you! This is why I am so excited about linen and why linen is such a wonderful fabric for your cushion! • It’s eco-friendly, very little to no chemicals, pesticides and fertilizers have been used. The plant will not thrive on chemicals! • Linen is very durable and strong, if taken good care of the fabric it will be in good quality for decades. • Linen is warm in winter, cool in summer. • Linen is antibacterial and antistatic, due to his flax and natural background. • Flax Linen is a renewable resource, it’s completely biodegradable. • It’s breathable, the unique structure of the fiber allows air to pass freely and it has the capacity to react to moisture by quickly absorbing or releasing the water. • Linen can absorb a fair amount of moisture without feeling unpleasantly damp to the skin, unlike cotton. • Linen is easy to take care of, since it resists dirt, has no lint or pilling tendency. 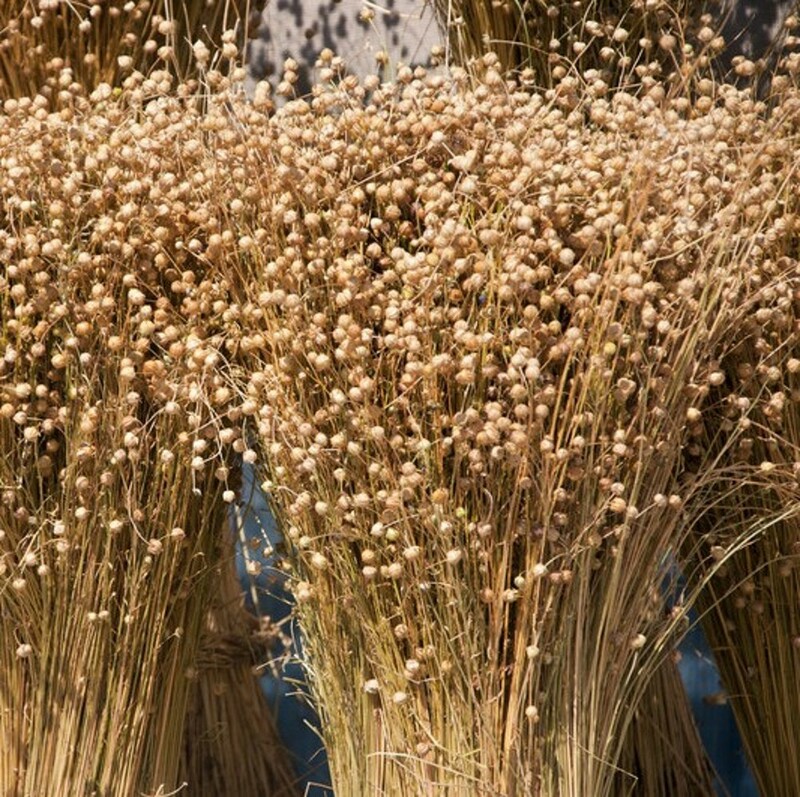 • Top quality flax is primarily grown in Western European countries, the fabric I use come from Germany, Lithuania and France, good to know! Besides all those amazing qualities, linen itself is just beautiful and mostly it will be purchased for its looks. Although the price of good quality organic linen is quite high, it’s really worth it! There is no fabric on this world looking more natural than flax linen and I hope you agree with me on that!